The 2018 British GT Championship enters its final round at Donington Park on September 22 – 23 and with the retirements announced of 2016 GT3 champion Derek Johnston and reigning GT3 champion Rick Parfitt Jnr, there will be plenty to make the weekend memorable and emotional. In the GT3 category, Flick Haigh and Jonny Adam, teammates in the #75 Optimum Motorsport Aston Martin V12 Vantage GT3, hold a 27.5 point advantage over rivals Jon Minshaw and Phil Keen in the #33 Barwell Motorsport Lamborghini Huracán GT3 with the #11 TF Sport Aston Martin pairing of Mark Farmer and Nicki Thiim just one point back on 121 points. With 37.5 points up for grabs, all three pairings have a shot. The substantial lead, however, of the Optimum Motorsport pairing means that barring a complete disaster for the #75 crew and a win for Minshaw and Keen, Haigh and Adam will be crowned GT3 champions on Sunday afternoon. The race for second place in the GT3 drivers’ standings is covered by only eleven points. 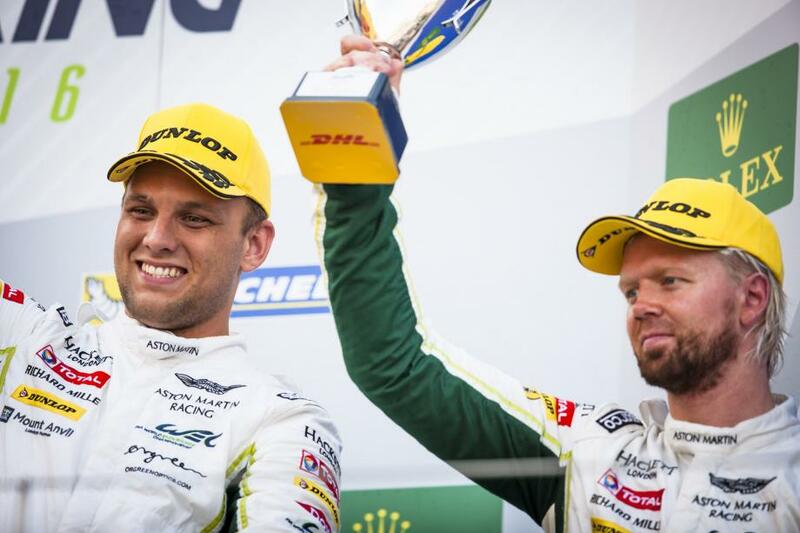 Mark Farmer and Nicki Thiim, driving the #11 TF Sport Aston Martin and currently lying third in the standings on 121 points, have Lee Mowle and Yelmer Buurman just ten points behind in the #116 ERC Sport Mercedes-AMG GT3. 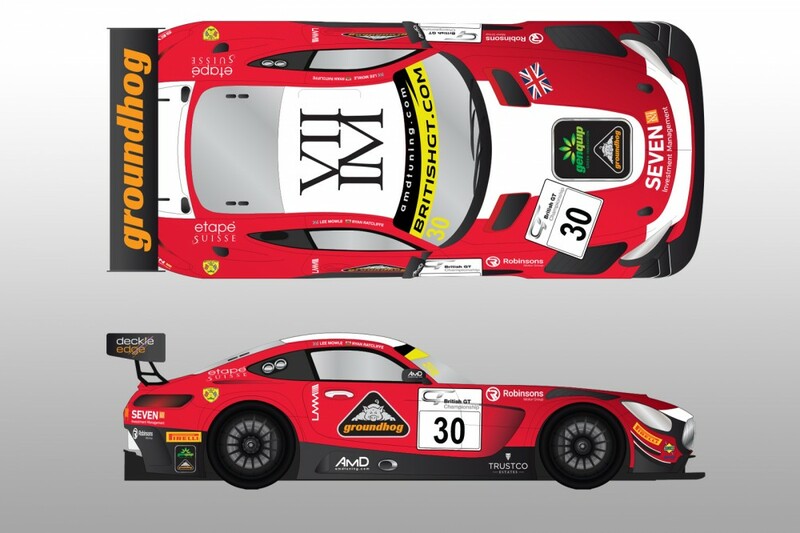 Were Adam and Haigh to win the GT3 title at Donington, history would be made. 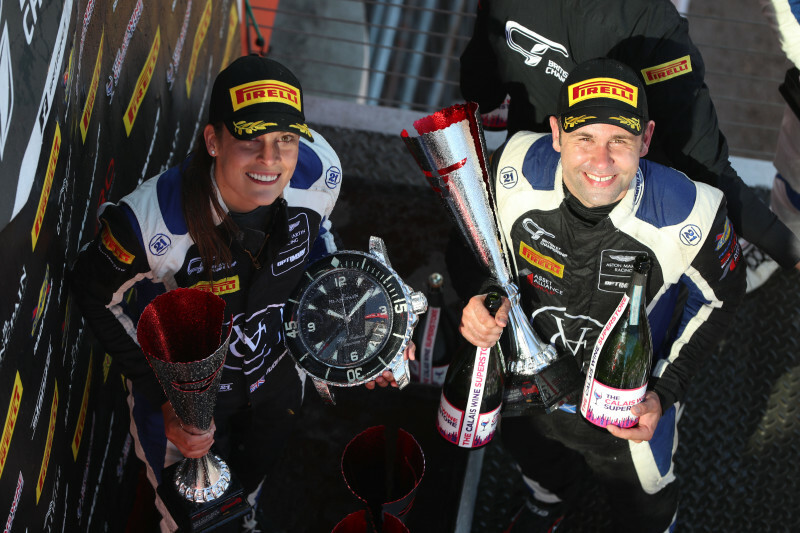 Flick Haigh would become the first female driver to win a British GT title and Jonny Adam would claim a record-breaking three GT3 titles with different teams. Adam is quietly confident but taking nothing for granted ahead of the title decider. If Adam and Haigh have a substantial lead in the GT3 standings, then the reverse is true in the GT4 category. 23 points separates the top six in the drivers’ standings with the #43 Century Motorsport pilot Jack Mitchell leading the way on 118 points followed by Bens Tuck and Green, teammates in the sister #42 entry, in second, just 10 points behind. The #55 HHC Motorsport pairing of Callum Pointon and Patrick Matthiesen complete the top six on 104.5 points. Pointon and Matthiesen will be looking to repeat their Rockingham showing and take victory in the GT4 class to give themselves the best chance of finishing the season as champions. 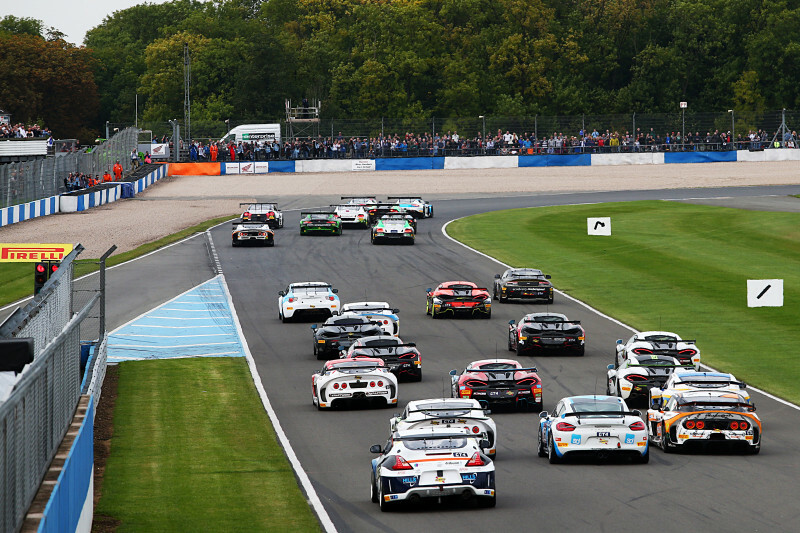 32 cars will take to the grid at Donington – 13 in the GT3 class and 19 in the GT4 category. Changes to the entry list for the previous round at Brands Hatch include the addition of three additional cars on the GT3 grid. RJN Motorsport is bringing its #24 Nissan GT-R NISMO GT3 to be piloted by Chris Buncombe and Struan Moore while Balfe Motorsport returns to the premier category with ex-GT4 champions Graham Johnson and Mike Robinson sharing the driving duties in the #101 McLaren 650S GT3 ahead of a possible 2019 full GT3 campaign. JMH Auto / John Seale is campaigning its Ferrari F444 Challenge with John Seale and Marcus Clutton behind the wheel. In the GT4 category Cicely Motorsport has entered its #25 Mercedes-AMG GT4 to be driven by David Fairbrother and Adam Morgan while UltraTek Racing team RJN will campaign its #54 Nissan 370Z GT4 to be driven by Stephen Johanssen, the second driver yet to be confirmed. Ben Barnicoat and Adam Balon will drive the #72 Balfe Motorsport McLaren 570S GT4. Track action opens for the British GT grid at 09:40 on Saturday September 22 for FP1 with the lights going out for the two-hour race at 13:35 on Sunday September 23. With the weather forecast predicting rain and lower temperatures, it could be a fascinating weekend. Don’t miss it!